When executed, it will create the requested formatter object, instantiate and execute an object associated with the needed action, and use formatter to print results. In case of an exception, an error message will be printed using the same formatter. To use API from another application, run it using FauxRequest object, in which case any internal exceptions will not be handled but passed up to the caller. After successful execution, use getResult() for the resulting data. Definition at line 41 of file ApiMain.php. Constructs an instance of ApiMain that utilizes the module and format specified by $request. Definition at line 170 of file ApiMain.php. References $code, ContextSource\$context, $request, $wgLang, Language\factory(), ContextSource\getConfig(), ContextSource\getContext(), WikiMap\getCurrentWikiDbDomain(), getErrorFormatter(), ContextSource\getLanguage(), RequestContext\getMain(), ContextSource\getRequest(), getUserAgent(), lacksSameOriginSecurity(), null, Hooks\run(), RequestContext\sanitizeLangCode(), ContextSource\setContext(), User, and wfDebug(). Add requested fields to the result. Definition at line 1144 of file ApiMain.php. References ContextSource\getConfig(), getErrorFormatter(), ContextSource\getLanguage(), ApiBase\getParameter(), getResult(), ApiResult\NO_SIZE_CHECK, null, wfHostname(), and wfTimestamp(). Referenced by setupExecuteAction(), and substituteResultWithError(). Check whether the current user is allowed to use high limits. Definition at line 2067 of file ApiMain.php. Check asserts of the user's rights. Definition at line 1501 of file ApiMain.php. References $params, $user, ApiBase\dieWithError(), ContextSource\getUser(), User\newFromName(), and wfEscapeWikiText(). Check whether we are readonly for bots. Definition at line 1462 of file ApiMain.php. References as, ApiBase\dieWithError(), ContextSource\getConfig(), and wfDebugLog(). Check selected RFC 7232 precondition headers. RFC 7232 envisions a particular model where you send your request to "a resource", and for write requests that you can read "the resource" by changing the method to GET. 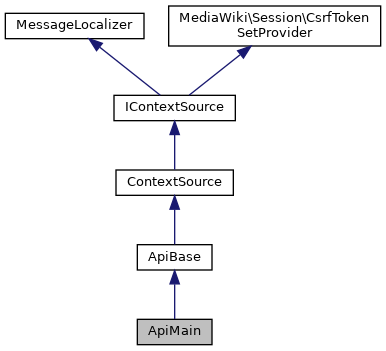 When the API receives a GET request, it works out even though "the resource" from RFC 7232's perspective might be many resources from MediaWiki's perspective. But it totally fails for a POST, since what HTTP sees as "the resource" is probably just "/api.php" with all the interesting bits in the body. Therefore, we only support RFC 7232 precondition headers for GET (and HEAD). That means we don't need to bother with If-Match and If-Unmodified-Since since they only apply to modification requests. And since we don't support Range, If-Range is ignored too. Definition at line 1317 of file ApiMain.php. References $e, $s, $value, ContextSource\getConfig(), WebRequest\GETHEADER_LIST, ContextSource\getOutput(), ContextSource\getRequest(), ContextSource\getUser(), null, Hooks\run(), wfClearOutputBuffers(), and wfTimestamp(). Check for sufficient permissions to execute. Definition at line 1415 of file ApiMain.php. References $user, checkReadOnly(), ApiBase\dieWithError(), ContextSource\getRequest(), ContextSource\getUser(), User\isEveryoneAllowed(), and Hooks\run(). Check the max lag if necessary. array $params Array an array containing the request parameters. Definition at line 1271 of file ApiMain.php. References $params, $response, ApiBase\dieWithError(), ContextSource\getConfig(), getMaxLag(), and ContextSource\getRequest(). Check if the DB is read-only for this user. Definition at line 1446 of file ApiMain.php. References checkBotReadOnly(), ApiBase\dieReadOnly(), ContextSource\getUser(), and wfReadOnly(). Create the printer for error output. Definition at line 991 of file ApiMain.php. References $value, createPrinterByName(), and ContextSource\getRequest(). Create an instance of an output formatter by its name. Definition at line 484 of file ApiMain.php. References ApiBase\dieWithError(), null, and wfEscapeWikiText(). Referenced by ApiFormatRaw\__construct(), createErrorPrinter(), and setupExternalResponse(). Encode a value in a format suitable for a space-separated log line. Definition at line 1716 of file ApiMain.php. Create an error message for the given exception. If an ApiUsageException, errors/warnings will be extracted from the embedded StatusValue. Any other exception will be returned with a generic code and wrapper text around the exception's (presumably English) message as a single error (no warnings). Definition at line 1022 of file ApiMain.php. References $code, $data, $e, $messages, $params, $type, as, ApiMessage\create(), ContextSource\getConfig(), WebRequest\getRequestId(), Message\newFromSpecifier(), and wfEscapeWikiText(). Referenced by logRequest(), and substituteResultWithError(). Any errors will be handled if the API was called by the remote client. Definition at line 498 of file ApiMain.php. Execute the actual module, without any error handling. Definition at line 1565 of file ApiMain.php. References $params, MWDebug\appendDebugInfoToApiResult(), checkAsserts(), checkConditionalRequestHeaders(), checkExecutePermissions(), checkMaxLag(), ContextSource\getContext(), getResult(), printResult(), reportUnusedParams(), Hooks\run(), setRequestExpectations(), setupExecuteAction(), setupExternalResponse(), and setupModule(). Referenced by execute(), and executeActionWithErrorHandling(). Execute an action, and in case of an error, erase whatever partial results have been accumulated, and replace it with an error message and a help screen. Definition at line 510 of file ApiMain.php. References $e, $t, executeAction(), ContextSource\getContext(), ContextSource\getRequest(), handleCORS(), handleException(), logRequest(), MediaWiki\preOutputCommit(), and sendCacheHeaders(). Definition at line 1865 of file ApiMain.php. References null, ApiBase\PARAM_DFLT, and ApiBase\PARAM_TYPE. Get a boolean request value, and register the fact that the parameter was used, for logging. Definition at line 1790 of file ApiMain.php. References $name, getVal(), and null. Definition at line 359 of file ApiMain.php. Get the ApiErrorFormatter object associated with current request. Definition at line 351 of file ApiMain.php. Referenced by __construct(), addRequestedFields(), and substituteResultWithError(). Definition at line 1914 of file ApiMain.php. Definition at line 1237 of file ApiMain.php. References ContextSource\getConfig(), Hooks\runWithoutAbort(), JobQueueGroup\singleton(), and wfHostname(). Get the API module object. Definition at line 382 of file ApiMain.php. Overrides to return this instance's module manager. Definition at line 2079 of file ApiMain.php. Referenced by ApiStructureTest\provideDocumentationExists(), and ApiStructureTest\provideParameterConsistency(). Get the request parameters used in the course of the preceding execute() request. Definition at line 1733 of file ApiMain.php. Referenced by logRequest(), and reportUnusedParams(). Get the result formatter object. Definition at line 391 of file ApiMain.php. Get the ApiResult object associated with current request. Definition at line 308 of file ApiMain.php. Referenced by addRequestedFields(), executeAction(), and substituteResultWithError(). Get the request parameters that should be considered sensitive. Definition at line 1750 of file ApiMain.php. Get a request upload, and register the fact that it was used, for logging. Definition at line 1801 of file ApiMain.php. Fetches the user agent used for this request. The value will be the combination of the 'Api-User-Agent' header (if any) and the standard User-Agent header (if any). Definition at line 2091 of file ApiMain.php. Referenced by __construct(), and logRequest(). Get a request value, and register the fact that it was used, for logging. Definition at line 1769 of file ApiMain.php. References $name, $ret, ApiBase\addWarning(), ContextSource\getRequest(), and null. Handle an exception from the ApiBeforeMain hook. This tries to print the exception as an API response, to be more friendly to clients. If it fails, it will rethrow the exception. Definition at line 637 of file ApiMain.php. References $e, false, and RequestContext\getMain(). Check the &origin= query parameter against the Origin: HTTP header and respond appropriately. Definition at line 672 of file ApiMain.php. References $request, $response, ContextSource\getConfig(), ContextSource\getOutput(), ApiBase\getParameter(), ContextSource\getRequest(), and null. Handle an exception as an API response. Definition at line 567 of file ApiMain.php. References $e, $response, ApiBase\addWarning(), as, createErrorPrinter(), ContextSource\getRequest(), ApiUsageException\getStatusValue(), null, printResult(), MWExceptionHandler\rollbackMasterChangesAndLog(), Hooks\run(), setCacheMode(), and substituteResultWithError(). Return true if the API was started by other PHP code using FauxRequest. Definition at line 299 of file ApiMain.php. Definition at line 1856 of file ApiMain.php. Get the security flag for the current request. Definition at line 316 of file ApiMain.php. References $lacksSameOriginSecurity, $request, false, ContextSource\getRequest(), null, and Hooks\run(). Definition at line 1628 of file ApiMain.php. References $e, $header, $name, $request, $time, $value, as, encodeRequestLogValue(), errorMessagesFromException(), ContextSource\getConfig(), WikiMap\getCurrentWikiDbDomain(), getParamsUsed(), ContextSource\getRequest(), WebRequest\getRequestId(), getSensitiveParams(), ContextSource\getUser(), getUserAgent(), UIDGenerator\newUUIDv1(), null, wfDebugLog(), wfTimestamp(), and wfUrlencode(). Definition at line 1759 of file ApiMain.php. Definition at line 1741 of file ApiMain.php. Attempt to match an Origin header against a set of rules and a set of exceptions. Definition at line 792 of file ApiMain.php. Attempt to validate the value of Access-Control-Request-Headers against a list of headers that we allow the follow up request to send. Definition at line 816 of file ApiMain.php. Definition at line 1923 of file ApiMain.php. References $header, $help, as, Html\closeElement(), Html\element(), Sanitizer\escapeIdForAttribute(), User\getGroupsWithPermission(), Sanitizer\ID_FALLBACK, Sanitizer\ID_PRIMARY, Message\listParam(), Linker\makeHeadline(), ContextSource\msg(), null, Html\openElement(), and Html\rawElement(). Print results using the current printer. Definition at line 1839 of file ApiMain.php. References $mPrinter, ApiBase\addWarning(), ContextSource\getConfig(), and ApiFormatBase\initPrinter(). Referenced by executeAction(), and handleException(). Report unused parameters, so the client gets a hint in case it gave us parameters we don't know, for example in case of spelling mistakes or a missing 'g' prefix for generators. Definition at line 1811 of file ApiMain.php. References ApiBase\addWarning(), getParamsUsed(), ContextSource\getRequest(), and Message\listParam(). Definition at line 873 of file ApiMain.php. References $name, $out, $response, $value, as, ContextSource\getConfig(), ContextSource\getOutput(), ApiBase\getParameter(), ContextSource\getRequest(), null, and wfTimestamp(). Set directives (key/value pairs) for the Cache-Control header. Boolean values will be formatted as such, by including or omitting without an equals sign. Cache control values set here will only be used if the cache mode is not private, see setCacheMode(). Definition at line 473 of file ApiMain.php. Set how long the response should be cached. Definition at line 400 of file ApiMain.php. Set the type of caching headers which will be sent. 'public': Cache this object in public caches, if the maxage or smaxage parameter is set, or if setCacheMaxAge() was called. If a maximum age is not provided by any of these means, the object will be private. 'private': Cache this object only in private client-side caches. 'anon-public-user-private': Make this object cacheable for logged-out users, but private for logged-in users. IMPORTANT: If this is set, it must be set consistently for a given URL, it cannot be set differently depending on things like the contents of the database, or whether the user is logged in. If the wiki does not allow anonymous users to read it, the mode set here will be ignored, and private caching headers will always be sent. In other words, the "public" mode is equivalent to saying that the data sent is as public as a page view. For user-dependent data, the private mode should generally be used. The anon-public-user-private mode should only be used where there is a particularly good performance reason for caching the anonymous response, but where the response to logged-in users may differ, or may contain private data. If this function is never called, then the default will be the private mode. Definition at line 432 of file ApiMain.php. References ApiBase\getParameter(), User\isEveryoneAllowed(), and wfDebug(). Definition at line 367 of file ApiMain.php. Set database connection, query, and write expectations given this module request. Definition at line 1609 of file ApiMain.php. References ContextSource\getConfig(), ContextSource\getRequest(), Profiler\instance(), and ApiBase\isWriteMode(). Set up for the execution. Definition at line 1175 of file ApiMain.php. References $params, addRequestedFields(), and ApiBase\extractRequestParams(). Check POST for external response and setup result printer. Definition at line 1532 of file ApiMain.php. References $params, $request, ApiBase\addDeprecation(), createPrinterByName(), ApiBase\dieWithError(), ApiBase\dieWithErrorOrDebug(), ContextSource\getRequest(), ContextSource\getUser(), and null. Set up the module for response. Definition at line 1190 of file ApiMain.php. References ApiBase\dieWithError(), null, true, and wfEscapeWikiText(). Replace the result data with the information about an exception. Definition at line 1060 of file ApiMain.php. References $e, $link, $path, addRequestedFields(), as, errorMessagesFromException(), ContextSource\getConfig(), getErrorFormatter(), MWExceptionHandler\getRedactedTraceAsString(), getResult(), ApiErrorFormatter\isValidApiCode(), ContextSource\msg(), ApiResult\NO_SIZE_CHECK, null, text, wfExpandUrl(), and wfScript(). Helper function to convert wildcard string into a regex '*' => '. Definition at line 857 of file ApiMain.php. List of available formats: format name => format class. Definition at line 113 of file ApiMain.php. Definition at line 161 of file ApiMain.php. Definition at line 149 of file ApiMain.php. Definition at line 156 of file ApiMain.php. Definition at line 155 of file ApiMain.php. Definition at line 2061 of file ApiMain.php. Definition at line 148 of file ApiMain.php. Definition at line 150 of file ApiMain.php. Definition at line 146 of file ApiMain.php. Definition at line 151 of file ApiMain.php. Definition at line 153 of file ApiMain.php. List of available modules: action name => module class. Definition at line 55 of file ApiMain.php. Definition at line 158 of file ApiMain.php. Definition at line 157 of file ApiMain.php. Definition at line 133 of file ApiMain.php. Referenced by getPrinter(), and printResult(). List of user roles that are specifically relevant to the API. Definition at line 130 of file ApiMain.php. When no format parameter is given, this format will be used. Definition at line 45 of file ApiMain.php. When no uselang parameter is given, this language will be used. Definition at line 50 of file ApiMain.php.